10 THE DOCTRINE OF CHANCES. chances of throwing 16 points with four dice. 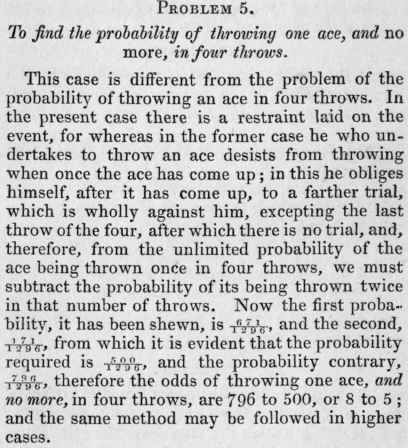 Let 16 be subtracted from 28, the sum of the two ex­tremes, 4 and 24, and the remainder will be 12; from which it may be concluded that the number of chances for throwing 16 points is the same as throwing 12 points. If A and B play together, and A wants hut one game of being up, and B two, what are their re­spective probabilities of winning ?